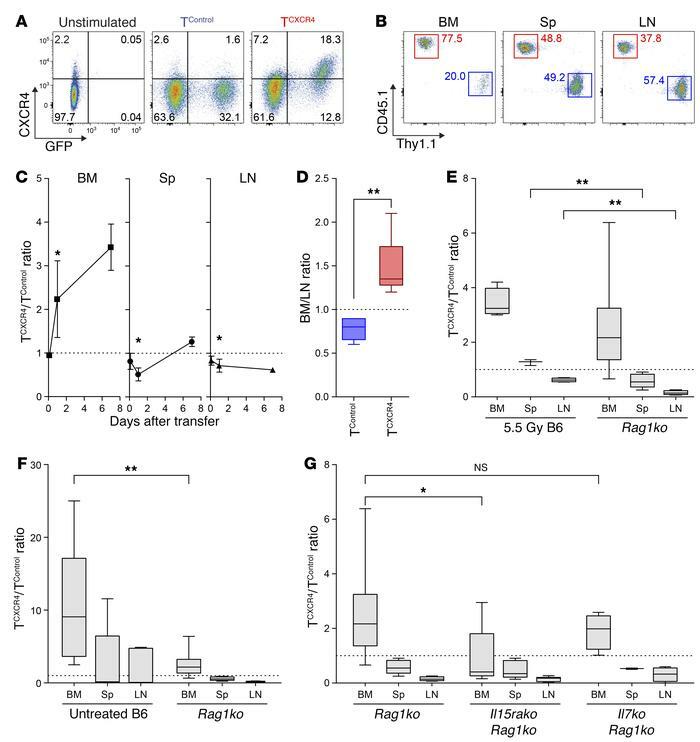 Adoptively transferred TCXCR4 demonstrate superior recruitment to the BM. (A) Representative flow cytometry plots for CXCR4 expression in untreated CD8+ T cells (unstimulated), TControl, or TCXCR4. Gating based on “fluorescence minus 1” controls. CXCR4 median fluorescence index (MFI): 380 unstimulated; 587 GFP+ TControl; 2,409 GFP+ TCXCR4. (B and C) Equal mixtures of TCXCR4 (CD45.1+) and TControl (Thy1.1+) were injected into sublethally irradiated B6 mice. Representative plots of TCXCR4 (red) and TControl (blue) frequencies in BM, spleen (Sp), and LN at day 7 are shown in B. Summary graphs in C indicate mean ± SD TCXCR4/TControl ratio at timed intervals in BM, Sp, and LN (n = 6 per group at 3 and 24 hours, n = 4 per group at day 7). Statistical comparison was performed by Wilcoxon’s signed-rank test against a hypothetical ratio of 1.0 (dotted line). *P ≤ 0.05. (D) Box-and-whisker graphs for BM/LN ratio on day 14 following transfer of TCXCR4 or TControl to separate sublethally irradiated B6 mice, calculated by division of percent GFP+ of BM CD8+ T cells by percent GFP+ of LN CD8+ T cells (n = 6 TCXCR4, n = 5 TControl). (E) Box-and-whisker graphs of TCXCR4/TControl ratio in BM, Sp, and LN at day 7 following transfer into sublethally irradiated B6 mice (n = 4) and untreated Rag1ko mice (n = 10). (F) Box-and-whisker graphs of TCXCR4/TControl ratio in BM, Sp, and LN at day 7 following transfer into untreated B6 mice (n = 11) and untreated Rag1ko mice (n = 10). (G) Box-and-whisker graphs of ratio of TCXCR4/TControl in BM, Sp, and LN at day 7 following transfer into Rag1ko (n = 10), Rag1ko.Il15rako (n = 10), and Rag1ko.Il7ko (n = 4). Statistical comparisons in D and E were made using the Mann-Whitney test (2-tailed). *P ≤ 0.05, **P ≤ 0.01. All data are pooled from 2–3 independent experiments.